Chinese smartphone brand OnePlus’ upcoming smartphone OnePlus 6T’s pre-booking offer has gone live on Amazon India’s website. The offer is visible under the ‘Deals’ section on the e-tailing website. 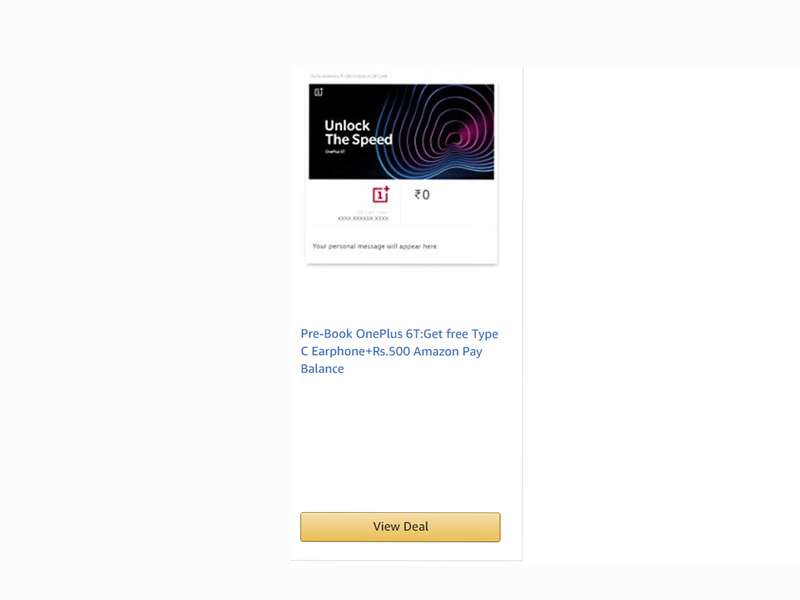 “Pre-Book OnePlus 6T: Get free Type C Earphone+Rs.500 Amazon Pay Balance,” reads the offer. This means all customers who pre-book the upcoming OnePlus 6T smartphone on the website will get OnePlus Type earphones and Rs 500 cashback in their Amazon Balance account. This means that all pre-booking customers will get benefits worth Rs 2,000 free. Currently, the offer seems inactive as the page simply redirects you to Amazon Gift Card page and does not reveal any more details about the pre-booking offer. The listing does not reveal any other details about the smartphone including its launch and shipping date. OnePlus 6T got listed on Amazon India’s website last month. OnePlus’s next flagship smartphone OnePlus 6T has been in rumours since months now. While some specifications of the smartphone have been confirmed by the company, including in-display fingerprint sensor and absence of 3.5mm headphone jack, there is still no clarity on the launch date of the smartphone. OnePlus co-founder Carl Pei has also reportedly revealed that OnePlus 6T will offer better battery life than OnePlus 6. Reports suggest that it will come with 3,500mAh battery with VOOC charge vs current OnePlus 6’s 3300 battery capacity. Recently, CEO Pete Lau also confirmed that the upcoming OnePlus 6T will neither offer wireless charging nor come with an IP rating.